When Zoe, restless black sheep of the Porter family, discovers that her biological father is a North Queensland cattleman, Peter Fairburn, her deep desire to meet him takes her from inner-city Brisbane to a job as a stockcamp cook. Zoe’s mother, Claire, is wrestling with guilt over Zoe’s discovery. She swears Zoe to secrecy, fearing that the truth could ruin the career of her high-profile politician husband. But when she is forced to confront her past, Claire also reassesses her marriage. On the muster at Mullinjim, Zoe meets brooding cattleman Mac McKinnon, who knows from painful experience that city girls can’t cope in the bush. Every instinct tells Mac that Zoe is hiding something. As the pressure to reveal her mother’s secret builds, Zoe fears she must confide in Mac or burst. 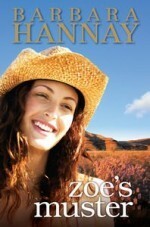 Review- Barbara Hannay is a well-established romance author for Harlequin and despite many of her stories featuring the Australian outback; Zoe’s Muster is the first of her novels to be marketed purely in the Australian rural romance domain. In Zoe’s Muster, Hannay clearly displays how proficiently she creates a steamy love story amidst the backdrop of Australian’s rugged land. This story explores various character viewpoints: Zoe, her love interest, Mac, her mother Claire and her biological father’s wife Virginia which creates a multidimensional view of the issues facing each of these characters. I immediately aligned myself with Zoe, twenty-eight years old and running a successful high tea (and cupcakes) business in Brisbane, trying to live up to the expectation of her politician father, Rex Porter. When she accidently stumbles across medical forms which states her parents blood types are completely at odds with her- Zoe and Claire must come to terms with the discovery that Rex isn’t Zoe’s biological father. Claire’s brief affair with cattleman Peter Fairburn up in the northern Queensland before she resumed a relationship with Rex and hastily married is the story behind Zoe’s conception. Zoe’s curiosity about her father and siblings she’d never known motivates her to accept a job as a cook on Mullinjim farm during a six-week muster. Much to her mother’s dismay, she makes Zoe promise to keep the secret of her lineage until after the election or she will risk Rex’s career. Zoe leaves a friend in charge of her business and arrives at Mullinjim, eager to try bush cooking and to meet her family. She instantly hits it off with her half-brother Luke but is upset by the news of Peter’s heart-attack, though he was recovering steadily. What she doesn’t expect is to be attracted to Luke’s best mate and neighbour Mac McKinnon the brooding, handsome cattleman who seems to take an instant disliking to her. Zoe struggles to keep her secret when Luke (her half-brother!) asks her out on a date and Mac is suspicious of her past. Hannay cleverly fleshes out each of the characters and provided Zoe and Mac with believable conflicts that keep them from pursuing a serious relationship. Zoe couldn’t bear to get in between Mac and Luke’s friendship with the secret hovering over their heads and Mac could never trust another city girl after his former fiancé broke his heart. But Zoe can’t help be attracted to Mac’s quiet, strong presence and he is drawn in by her adaptive, hard-working approach to the muster that makes her perfect for a cattleman’s wife. And the sexual tension between them? WOW. I couldn’t stop turning the (electronic) pages during those scenes because the emotional and physical connection between Zoe and Mac was clearly expressed and at times, quite moving. I highly recommend Zoe’s Muster for any romance fans who enjoy strong characterisation, steamy love scenes and a vivid Australian setting. I’m going to hunt down some of Hannay’s former titles because I enjoyed her writing style so much! About the author: Barbara Hannay began writing romance novels after teaching a unit of popular of popular fiction to her Yr 11 class. This was when she read her first Harlequin romance and it was love at first sight. 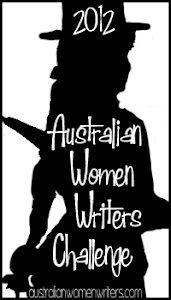 She immediately wanted to write a romance story of her own and her first published novel was Outback Wife and Mother. These days, Barbara’s books are sold all over the world, and have garnered many awards, including the RITA ® award, the Romantic Times Reviewer’s Choice award, as well as Australia’s Romantic Book of the Year award. Barbara lives in tropical North Queensland where she and her writer husband have raised four children. I loved this one too! I thought the characterisation was superb. is this only a ebook? It’s in print as well Helena. It’s just been released so it may not be stocked everywhere yet, though it is currently available in paperback from Fishpond (see the purchase links above) if you live in Australia. Must’ve totally missed the links, ooops! I, unfortunately, don’t live in Australia. I did look at Amazon cause I know they ship internationally, but they only seem to have the book in Kindleversion so far.